"For me, this is summer on a slice of bread. 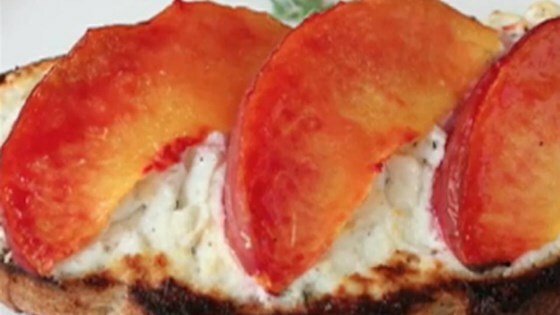 August is national goat cheese month (no, I don't know who decides these things), and what better way to enjoy chevre than by topping it with sweet, ripe, impossibly juicy peach slices? Mix in a little thyme and black pepper to keep things interesting, and you're looking at a very special treat." This was extremely tasty! The olive oil was a nice touch. I love Chef John's videos, he always makes me laugh out loud and plus they're yummy recipes! Be careful because it burns the edges of the bread very quickly. Very easy to make. I used melba toast instead.